The Lexus CT 200h hybrid hatchback is being marketed under “The Darker Side of Green” campaign and realized by a new interactive online game called “The Dark Ride.” Game players ride shotgun and get a good look around the inside and outside of the CT 200h. Several action packed moments take place to showcase how cool and fun the CT 200h is provided your idea of fun is driving to avoid bad guys and sharing a car with Tony, Lexus’ star bad boy in the Dark Ride. The only real issue I have with the site is the time it takes to start the game. Setup involves allowing access to a webcam and talking into your computer’s microphone. Talking into a microphone isn’t very work environment conducive so that causes some delays. Also the game is really more of a movie where you click or talk to engage decisions. The car is driven by The Boondock Saints actor Norman Reedus who does an excellent job keeping the energy up. As the participant, it is a bit more of a passive experience though still more engaging than simply watching a video. 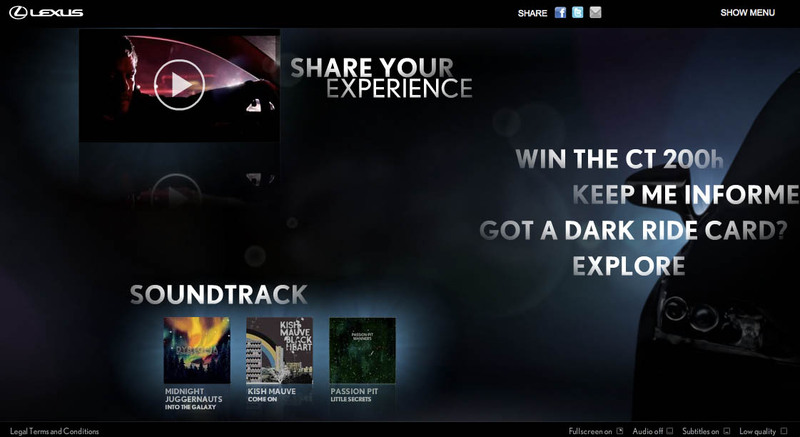 After the experience is over, Lexus showcases a couple music artists from the soundtrack that link out to iTunes. People can also enter their information up to three times to either stay informed about the CT 200h, win a CT 200h, or if they have whatever a “Dark Card” is they can enter information to get invited to special events that will happen in Miami, New York, Chicago, and Los Angeles.